Last weekend, Wunjo Bass shut up shop at No. 22 and moved out, but only as far as next door to the basement of No. 23, below Wunjo’s existing keyboards shop. 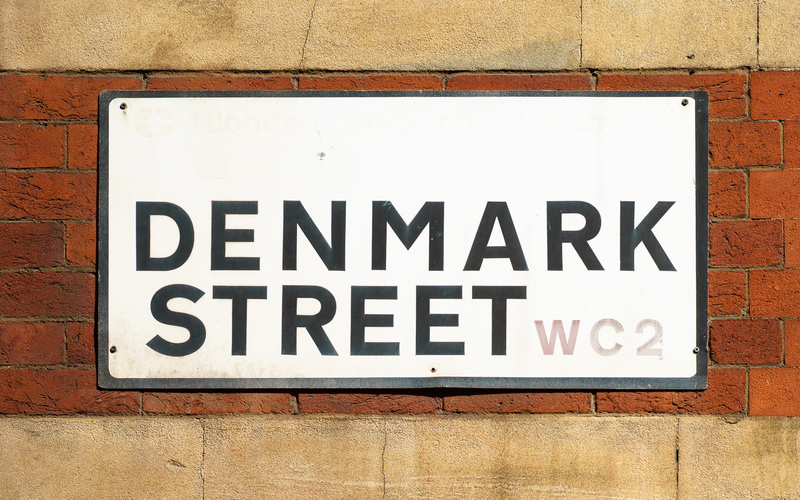 The move has been prompted by a refurbishment programme being undertaken by the landlord, owner of most of the property on Denmark Street and also of the St. Giles Circus development that is going on behind its northern side. Over the course of the next two or three years, all their premises along the street are being gutted and refitted to modern standards, including a full electric rewire. The refurbishment of No. 22 is expected to take between six months and a year to complete. For Wunjo Bass, beyond a much better working building, the security of a long-term lease instead of one measured in weeks or months offers an attractive prospect for when they return. In a curious twist, the basement of No. 23 was the original home of the Bass Cellar before they moved in to No. 22. Brian Rowe’s Wunjo then took over No. 22 for their own bass shop, so in a way it’s a bit of a homecoming. The actual moving of stock from the old to the new shop began at 6pm on Saturday and was complete about the same time the next day. Preparations, however, had begun a couple of weeks earlier: clearing old items in storage from the basement, painting, decorating and sorting out the space outside. A potted palm provides a splash of green at the bottom of the stairs. That the pot also contains a pink cocktail umbrella adds an element of whimsy. Despite being in a basement, the new shop feels brighter than the old one, which admittedly was quite dark inside. It is certainly far better lit. The window space is deeper than before, allowing a rather more considered display than was possible previously. Tucked in a corner, a neon Warwick sign provides a little pizazz. Of course, everything inside is painted in Wunjo’s trademark orange hues; bring your shades if you are recovering from a heavy night out on the tiles. The sales counter is considerably smaller than it was, but there is more floor and wall space for basses on display. The opportunity was taken to make some tweaks to the organisation of the brands around the shop. It is now easier to distinguish the ranges from each maker; Musicman in particular benefit from a move to near the door. Oh, and that jazzy carpet is still there, in pride of place. “Every day I turn up to work and I think, I know it sounds crazy, but you’re only as good as the last day you did. You can never turn off. You are always thinking about the shop, the customers, the space. Always [making it] feel like it’s fresh all the time. We did that in the old shop, but this has given us more reason to look at everything in a different way. That can only be a healthy thing. The shop have been publicising the move with photo updates of progress on their social media accounts. Fluorescent orange flyers gaffered to any available surface direct people downstairs from the old shop and perspex sign attached to the railing proclaims WUNJO BASS in bold, several-hundred-point capital letters. Half way into the first week of trading from the basement and with the last of many cardboard boxes used in the move being sent for recycling, the strategy is apparently showing signs of success.